Daniel Monrow Fink was the third child born to Daniel Fink and Elizabeth Beaver. May 1st 1834 was born to Daniel Fink a son and was baptized the 12th August 1838 and named David Monrow. Both the 1850 & 1860 Census lists this son as Daniel M. Fink, more than likely this same Daniel Monrow Fink. 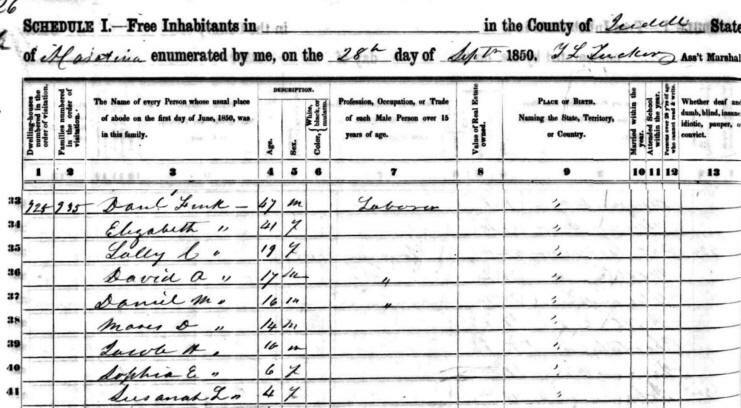 The 1850 Iredell County Census shows that Daniel Monrow Fink was 16 years old and living at home with his parents and all of his siblings. The 1860 District South of the Yadkin Census for Iredell County shows that Daniel Monrow Fink was 24 years old and living at home with his parents and siblings. Older brother David Alexander had left the family home and was living by himself in the Rocky Creek District of Iredell County. Daniel's occupation was listed as "Miller". Next-to-oldest son Daniel Monrow Fink was the last of Daniel & Elizabeth's sons to enlist. Daniel enlisted as a Private on 26 Feb 1862, in Iredell County, NC, at the age of 28. Daniel became part of Company A, 33rd Infantry Regiment North Carolina. This was the same Company & Regiment that youngest brother Jacob was in. Daniel died from wounds on 02 Jun 1864 at Lynchburg, VA.